A few days ago, my hero died. My Grandma Ann, who some of you may remember from my book dedication, passed away on Sunday evening after a long battle with cancer. That’s her in the photo, running her first marathon. At fifty. She didn’t let her age restrict her. Not even at the end. 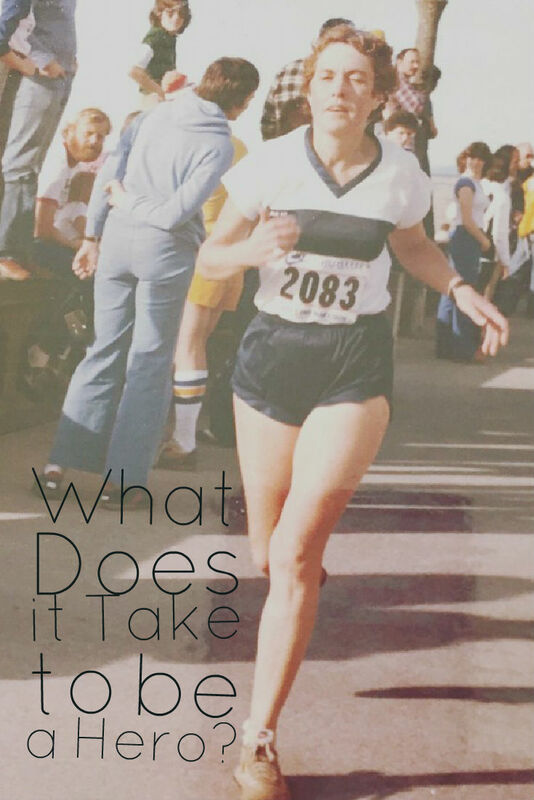 As long as she was able, she ran, then walked through her neighborhood daily. She went to college when her kids were grown. Not a lot of women went to college when she was younger. She did not let society’s ideas about gender limit her. She traveled the world with my Grandpa Jim. (He was another great hero, a fire chief, Purple Heart recipient and a wonderful man.) They spent 18 months living in Costa Rica and learned Spanish to do so. She also drove from Maine to Oregon with him- in a fire truck. She didn’t turn away from adventure. She was always kind, even when she did not have to be. She acted with grace and respect at every turn. She was stubborn in the best possible way. As an author, I create pretend heroes. The heroine of my book takes characteristics from my grandma. This is no accident. When I was writing “Nellie Nova Takes Flight,” I used a writer’s workbook to help me fine-tune the book. At one point, it asked me to think of a moment when someone showed a characteristic I wanted my protagonist to have and I thought of my grandma. A few years ago, my grandma fell and broke her hip. I flew from TX to WA to visit her after she had hip replacement surgery. The next day, the hospital staff asked her to walk, with a walker. I thought, “That’s too much! She’s still recovering! She’s in pain!” But my grandma got up and did it. Each step was excruciating, but I vividly remember the look of determination in her eyes. I will never forget that strength. She was strong beyond measure. That moment is what I looked back on when I wanted to think of ways to make my character strong. There are several definitions out there that tell us what a hero is supposed to be, but I don’t need one. I have a lifetime of memories of my grandmother to illustrate what the life of a hero should look like. I only hope I can live my life with half of the strength,dignity,and bravery that she did. Goodbye, Grandma. I’ll see you again someday. Who are your everyday heroes? Tell me about them in honor of my Grandma Ann.